Frozen Banana Bites…A delightful sweet summer treat from (Never Home) Maker! I’ve made chocolate dipped banana “popsicles” many times, but I like this small bites version better. Yum. Great idea for little fingers! I love frozen bananas dipped in chocolate, and especially when rolled around in nuts! What a simple but great way to make them- this way, I can actually make it for a dinner party next time. 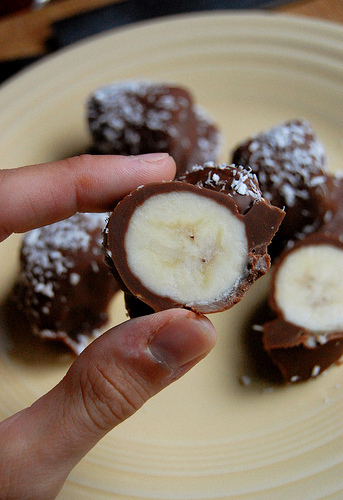 I’ll just have a tray of already made choco-banana bites and just throw them out on the table after dinner. Thank you so much for the wonderful tip! Any other fruit you could freeze? My DD is allergic to bananas. I think this would also be great with, strawberries, blueberries, raspberries, maybe even apples! You have just inspired me to make these and start cooking big batches of food ahead of time. I hate cooking, but i love feeding my family well and it’s just a huge chore on nights that we have extra homework that wasn’t expected or an emergency happens. I think i’m going to do this from now on!